This compound has been shown to inhibit the binding of [3H] GABA (g-amino butyric acid) or [3H] strychnine of cerebrocortical or spinal cord membranes. [3H]TCC was also displaced in a concentration-dependent manner by GABA or by several agonists or antagonists of the type A receptor for GABA (GABAAR). TCC has been thought to act as a GABAAR agonist that induces depression of the central nervous system and, in turn, myorelaxation. Moreover, TCC possesses a molecular structure similar to that of colchicine, a plant alkaloid that binds to tubulin and induces the depolymerization of microtubules, disrupts axonal transport, and inhibits mitosis. Following oral administration, thiocolchicoside is well absorbed from the gastrointestinal tract. It shows its effect in 1-2 hours after oral administration and peak plasma level is achieved in about 0.7 hours and Elimination half-life is about 2.5-5 hours. Its effect is continued for 24 hours. 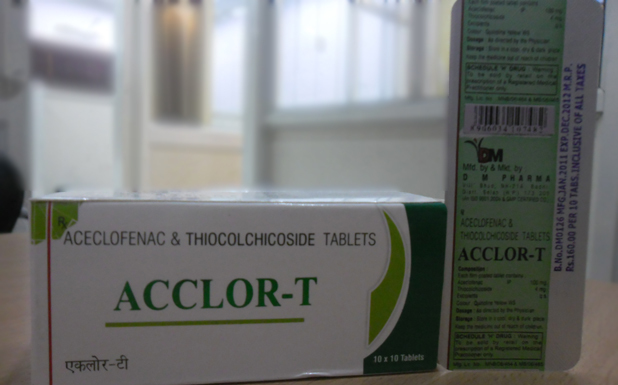 ● Hypersensitivity to Thiocolchicoside or Aceclofenac or any component of the tablet. Drug interactions associated with aceclofenac and thiocolchicoside are similar to those observed with other NSAIDs. Aceclofenac may increase plasma concentrations of lithium, digoxin and methotrexate, increase the activity of anticoagulants, inhibit the activity of diuretics, enhance cyclosporin nephrotoxicity and precipitate convulsions when co-administered with quinolone antibiotics. Furthermore, hypo or hyperglycaemia may result from the concomitant administration of aceclofenac and antidiabetic drugs, although this is rare. The co-administration of aceclofenac with other NSAIDs or corticosteroids may result in increased frequency of side effects.